The NetShelter Horizontal Cable Management family offers cable management for network switching and server applications. Both require lots of cable and flexibility and the NetShelter SX cable management products help keep those cables organized and clean. 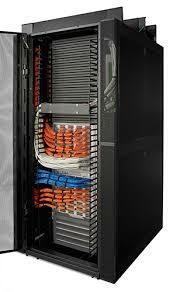 The AR780A secures cabling outside the 19″ aisle full access for user-replaceable components. This family of products is modular and Power Solutions can help you find the right options for your needs.